When Netflix gave Patriot Act With Hasan Minhaj a 32-episode order before the series premiered, the move was seen as a huge display of confidence, if not an outright gamble. For all its other programming victories, the streamer has yet to gain a toehold in the talk-show genre; in the last year, it’s canceled series from Chelsea Handler, Michelle Wolf, and Joel McHale. (Cancellation isn’t necessarily an indication of their quality, though, and certainly not in the case of The Break.) And the shows it hasn’t axed yet—My Next Guest Needs No Introduction With David Letterman and Norm Macdonald Has A Show—just come across as raunchier versions of the network offerings, centering as they do on amiable chats among established performers. Ditto Comedians In Cars Getting Coffee, which Netflix lured away from SonyCrackle in a caffeine-fueled coup earlier this year, but offers little beyond its marquee-name guests. Unlike its involvement in the rom-com resurgence, Netflix can hardly be seen as leading the conversation when it comes to engaging talk shows. Patriot Act, an appealing comedy-talk show hybrid from longtime collaborators Hasan Minhaj and Prashanth Venkataramanujam, isn’t going to singlehandedly swing things Netflix’s way, but it is the streamer’s best offering yet in the genre. The series made an assured debut today, offering two episodes that cover diverse and very involved subject matter—including affirmative action and the draconian policies of a self-styled Saudi reformer—in a way that is unflinching but never overwhelming. There’s a slight format change between installments, but there’s no sense of scrambling in the addition of a pre-taped segment with some swearing tweens. That short feels every bit as thought out as the extensive reporting on college admission policies and professional litigant Edward Blum, the kind of conservative fuckwad who cries “reverse racism” over a purported decline in the enrollment of white college students at Ivy League universities. Patriot Act arrives fully formed and with a lot on its mind—and an incredibly witty way of dispensing that information. The premiere is basically an incisive, 25-minute monologue from the erstwhile Daily Show correspondent on affirmative action, while the second episode splits its time between calling out the inauthenticity of Prince Mohammad bin Salman’s (known as MBS to friends, subjects, dissidents, and murdered journalists) reform efforts—as well as Western media’s credulity in reporting them—and some deplorable, diaspora desis like Bobby Jindal and Dinesh D’Souza. These segments are well researched (Minhaj made a point of hiring journalists from The New York Times and ProPublica) and presented in an accessible manner, keeping Patriot Act firmly in the territory of informative comedy instead of edging into Newshour. Of course, the same could be said for series like Full Frontal With Samantha Bee, Last Week Tonight With John Oliver, and newcomer Wyatt Cenac’s Problem Areas (The Rundown With Robin Thede was also great and in a similar vein, but was much more concerned with timeliness than these other shows from TDS alums). Minhaj even walks around his set, having ditched the anchor desk just like Bee and Cenac, and has his talking points splashed across screens in the background. Even the decision to get off the information treadmill and take the long view of politics is one that Patriot Act shares with Full Frontal and Problem Areas. 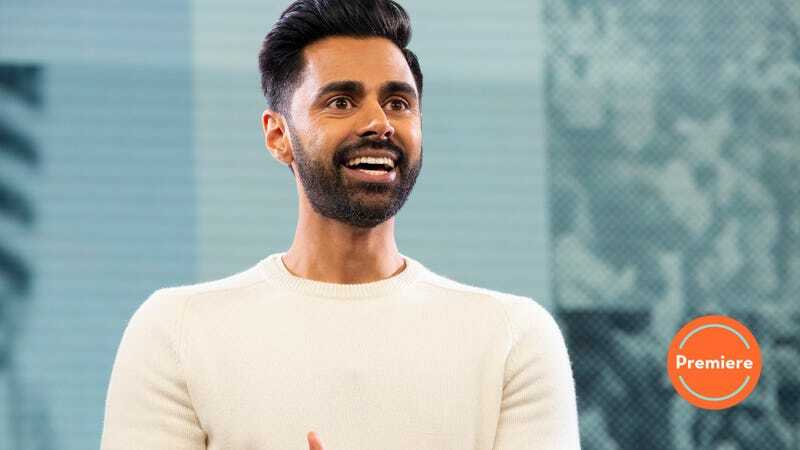 Minhaj is breaking ground as the first Indian-American to host a weekly comedy show, but the general framework for his show is really only innovative when compared to the networks’ late-night offerings. That isn’t a knock at Minhaj and Venkataramanujam, who set out to make a show that would focus more on entrenched issues (albeit with the occasional timely entry point), granting their viewers a reprieve from the onslaught of bad news—and questionable reporting. The result is an engrossing mix of deep dives, personal asides, and current events, all delivered with Minhaj’s winning aplomb. But I’ve been a bit baffled by previews for this show that lauded the decision to look at the big picture (or political landscape), as if it had been heretofore unseen. John Oliver might sit behind a desk (when he’s not introducing Lin-Manuel Miranda or unveiling Russell Crowe’s jockstrap), but Last Week Tonight has been airing in-depth pieces along with recurring bits and shorter spots since its debut. Full Frontal continues that tradition, as does Problem Areas, which was the first of these weekly shows to introduce a season-long arc (focused on police brutality and reform). What really sets Patriot Act apart is its host: Minhaj is just so damn charismatic; he’s like Ms. Frizzle for budding policy wonks. The comedian and host has the kind of star quality that lights up the stage as brightly as the screens behind and below him. His animated delivery makes even a data dump on college enrollment and standardized testing fly by (credit is also due Marc Janowitz, whose set design sends sobering statistics zooming around and looming behind the host—the show could never leave the soundstage, and still never look the same way twice.) As he strolls and doles out info, Minhaj’s lanky gait captures Patriot Act’s measured and wide-ranging approach, darting to the left for a niche joke about advance placement classes or Kumon before returning to center stage to tie together the last 10 minutes of figures or jaw-dropping reports about human rights violations. Minhaj’s appeal is multi-faceted: he’s charismatic, yes; funny, definitely; and, as an Indian-American, he also offers a unique perspective. Now, after setting a new standard for stand-up specials with Homecoming King, Minhaj is upping the game for news-comedy shows. The same stealthily hilarious and poignant storytelling is in Patriot Act, too, as the dive into affirmative action yields another revelation about the host. With its hefty episode order, Netflix banked on Minhaj in a most public manner—but with each installment of Patriot Act, that bet looks more and more like a sure thing. There are obviously a lot of unknowable factors that informed Netflix’s decision to cancel all those talk shows. Their cancellations are not a reflection of their quality—certainly not in the case of The Break With Michelle Wolf, which took some time to get its footing, but was full of the kind of uncompromising, irreverent humor so many platforms only purport to want. In interviews, Minhaj sounds like he wants to make Patriot Act the “global citizen” of talk shows (or late-night shows, or comedy shows, or whatever you want to call it), one that’s not centered on U.S. politics, and therefore uniquely capable of taking advantage of the 190 country-platform Netflix has to offer. Things you definitely wouldn’t hear about from any of the late-night Jimmies/Jameses: Fair & Lovely cream, lotas, and anti-blackness in Asian-American and Asian immigrant communities. Full disclosure: former Clickhole staff writer Sofia Manfredi now writes for Patriot Act.